The Samsung Galaxy Note 3 comes with the same 13 MP snapper that we found and loved on the Galaxy S4 but with some additional perks, like the Photo Sphere-like Surround Shot. The 13MP camera is good for photos of up to 4128 x 3096 pixels in its native 4:3 aspect. The user interface is based on the Galaxy Camera interface. A single viewfinder handles both still and video capture, so you don't have to switch modes. However, this is certainly not the most convenient solution as, if you're shooting full resolution 13MP photos, you'll have to frame your videos using a 4:3 viewfinder. The majority of the settings is located in the top left corner. Still, there a number of interesting options here like the setting for the volume rocker to act as a still shutter key, a video shutter key or a zoom lever. The HDR mode (Rich Tone) can be set to save a normal and an HDR photo or just the HDR one. Another interesting option is contextual file names - the Galaxy S4 will name photos with your location (the GPS needs to be on for this to work). Then we get into the more interesting shots. Surround shot is Samsung's name for Photo Sphere, which creates a spherical panorama, similar to those in Street View. Eraser helps you remove moving objects (e.g. tourist waling into your shot). Sound & shot captures a photo and records ambient sound. It sounds pretty cool - for example, you can hear the sea gulls in a beach photo or the roaring of car engines if you're at a race - but we had problems sharing the shot. 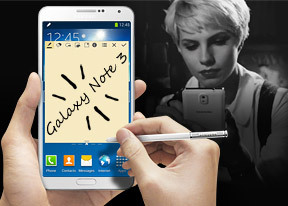 All the Galaxy Note 3 would send is the still image, a JPEG, and the sound remains on the phone. Shame that Samsung didn't use the standard Audio note feature of JPEG photos for this one. Now to the most important part - image quality. If you were happy with the Samsung Galaxy S4's excellent 13 MP snapper then you will love the Galaxy Note 3 snapper. Images have a lot of detail in them even in less than perfect weather (cloudy weather) noise is kept well under control. White balance is pretty natural and colors nice and punchy. HDR stills come out great as well. The Samsung Galaxy Note 3 does well to develop the highlights that would otherwise be clipped, while shadows are only improved slightly, so contrast is still great and images don't look too flat or unrealistic. HDR images have an excellent amount of fine detail, too. Panoramas on the Samsung Galaxy Note 3 can go as high as around 60 MP but only if you shoot in portrait mode as the images come out just over 3000 px tall, while in landscape panorama shooting you're getting an average of around 1600 px, which isn't ideal. In either mode you can shoot images around 19-20000 px wide. The stitching is seamless and the software uses the gyroscope and accelerometer to guide you and warn you if you're going too fast or moving off the right line. To put the Samsung Galaxy Note 3 camera performance in perspective we did an impromptu shootout between it and the LG G2 smartphone. LG G2 has a similar (if slightly wider) field of view and identical resolution so the two are easy to compare. On paper the G2 has the advantage of OIS, but since we used a tripod for the shots that didn't help it here. The two contestants were virtually on par, with the amount of detail about even on the two shots. The Galaxy Note 3 applies more aggressive sharpening, which makes its images appear sharper, but also has a dash more artifacts. The LG G2 has slightly more noise too. The Samsung Galaxy Note 3 is more than capable of carrying its own weight in our Photo Comparison tool. We've selected the excellent LG G2 and Galaxy S4 13 MP shooters to rival it and the fight is certainly fierce. The Samsung Galaxy Note 3 (the Snapdragon 800 edition) premiers 2160p video capture, more commonly referred to as UHD 4K or just 4K. It translates to videos of 3840 x 2160 resolution, or in other words, four times the resolution of 1920 x 1080 FullHD clips. The latter is also available on the Samsung Galaxy Note 3 in standard 30 frames per second mode along with the smooth 1080p@60fps video recording. Note that in 4K video shooting you can't use Dual Shot mode and doesn't allow stills capture during recording, while in 1080p recording you can snap full-res 8 MP 16:9 aspect images. 30 fps FullHD videos carry the bitrate of around 16 Mbps, while 60fps movies take about 30Mbps. Audio is captured at 122 Kbps with a sampling rate of 48 kHz with 2 channels (read stereo). The more interesting 2160p video recording mode carries a very high 47 Mbps bitrate (almost three times that of 1080p videos) for the same 30 fps framerate. Audio is recorded with a bitrate of 123 Kbps with the same 48 kHz sampling rate. 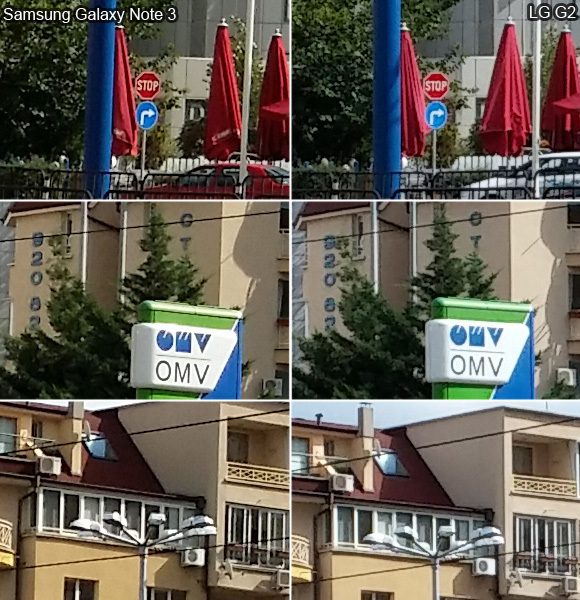 During 1080p video recording you can zoom up to 4x times with the Galaxy Note 3 retaining the same quality up to 2x zoom (because the camera is capable of the double 2160p resolution). Beyond the 2x zoom, things start to downgrade rather quickly. Here goes the 2160p video sample. The detail levels are very high, which coupled with the immense resolution makes the Samsung Galaxy Note 3 truly the best camcorder smartphone out there. The quality of the Galaxy Note 3 4K videos is so good that in good light each of its frames has more detail than, say, the HTC One's 4 MP stills. Things follow suit with the 1080p video recording. Aside from the obvious resolution drop the video carries the same great qualities - high detail levels and nicely rendered colors as well as consistent framerate. And here you can check out the zooming capabilities of the Galaxy Note 3 during 1080p video recording. First we zoom all the way up to 4x where things look rather poo, but once we back up to 2x we basically get the same quality as non-zoomed 1080p footage. And here's an untouched 1080p @ 60fps (5 seconds, 18.9MB) video sample taken straight off the Galaxy Note 3. The Samsung Galaxy Note 3 enters our video comparison tool to claim the biggest prize - the camcorder crown. We've enrolled it in full 4K glory and in 1080p fashion so you can see just how better the 2160p video recording is. You can clearly see the sort of advantage 4K video recording gives here.